All the action from the recently concluded popular choice awards night. Actress Shailene Woodley and her film The Fault In Our Stars swept the 2015 MTV Movie Awards, held over the weekend in Los Angeles, California. Singer-actress Jennifer Lopez, who won the Best Scared as Sh*t Performance in The Boy Next Door, showed off her shapely pins in a black number. The Best Villain award went to Meryl Streep for Into the Woods. The Fault In Our Stars star Shailene Woodley won the Best Female Performance award and the trailblazer nod too. Her film also won the Movie of the Year trophy of the night. Hot Pursuit costars Reese Witherspoon and Sofia Vergara present the Best Kiss award. It went to Shailene Woodley and Ansel Elgort for The Fault in our Stars. Producer Judd Apatow arrives with his daughter Iris. Model-actress Emily Ratajkowski attends The 2015 MTV Movie Awards at Nokia Theatre LA Live. 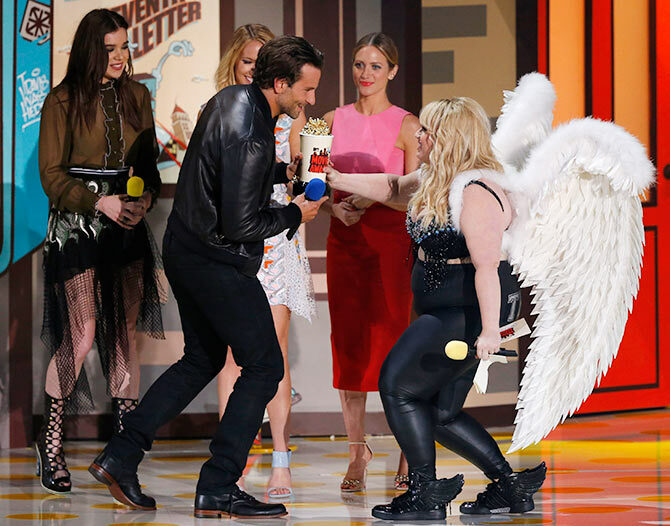 Actress-comedienne Rebel Wilson presents the Best Male Performance to Bradley Cooper for his portrayal of the late American sniper Chris Kyle. The Best Hero award went to Dylan O'Brien for The Maze Runner, Channing Tatum won Best Comedic Performance for 22 Jump Street. 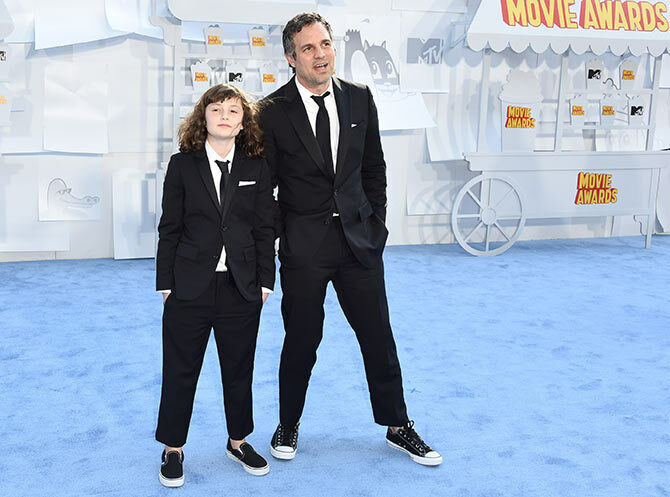 In one of the most adorable sights from the show, Foxcatcher actor Mark Ruffalo turned up to attend the awards with his daughter Bella Noche. The duo wore identical tuxedos to the event. Look at that badass stance! She's already a star! Dancer Amber Heard shows off her curves in a skin tight number. Why is Miley Cyrus on an IV drip! ?